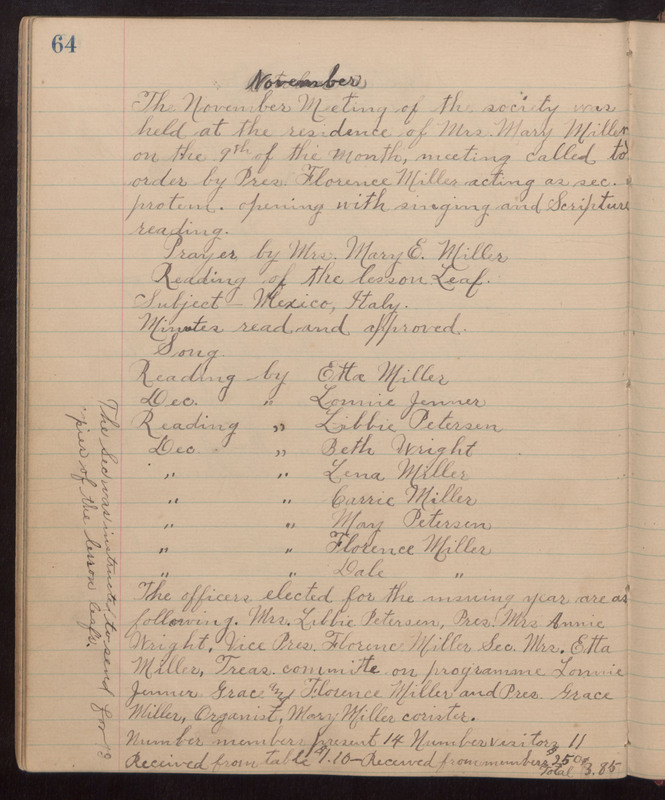 64 November The November Meeting of the society was held at the residence of Mrs. Mary Miller on the 9th of the month, meeting called to order by Pres. Florence Miller acting as sec. protem. opening with singing and Scripture reading. Prayer by Mrs. Mary E. Miller Reading of the lesson Leaf. Subject--Mexico, Italy. Minutes read and approved. Song Reading by Etta Miller Dec. " Lonnie Jenner Reading " Libbie Petersen Dec " Beth Wright " " Lena Miller " " Carrie Miller " " May Petersen " " Florence Miller " " Dale " The officers elected for the insuing year are as following. Mrs. Libbie Petersen, Pres. Mrs. Annie Wright, Vice Pres. Florence Miller Sec. Mrs. Etta Miller, Treas. committe on programms Lonnie Jenner Grace and Florence Miller and Pres. Grace Miller, Organist, Mary Miller corister. Number members present 14 Number visitors 11 Received from table $1.10-Received from members $2.50 Total $3.85 ^and here is a handwritten note along the left side of page The Sec was instructed to send for 19[?] pies or the lesson leafs.